With our partners, World Vision Canada, MANA Nutrition and your generous donations; we have been able to supply a shipping container of Ready-to-Use-Therapeutic Food (RUTF) to the Tandjilé region of Chad. 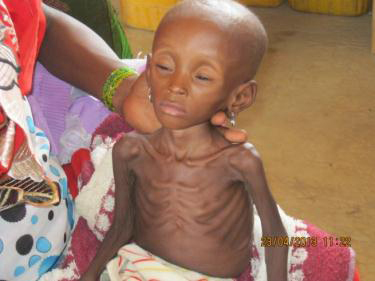 Recent nutritional studies have shown severe malnutrition at a rate of 17% amongst children in this region. Of the 2,953 identified, 1,743 have passed away. These statistics are alarming, but thanks to RUTF and our donors, 1,210 children are now registered in the RUTF treatment program. Meet Kadidja. 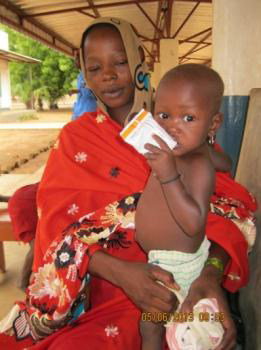 In April 2013, she was diagnosed with Severe Acute Malnutrition (SAM). After being treated with RUTF for only 4 weeks, Kadidja started to perk up, gain weight and was literally brought back to life. Your donations are needed to ensure other children and families can experience the miracle wonders of RUTF as well. Donate today!